Searching for an affordable treadmill can be hard because the market is saturated with options to choose from. But if you know what types of features you are looking for, it can make it a lot easier to narrow down your choices. And we have made it even easier for you as well by showing you our top picks in the best treadmill in the market today, one of which is the ProForm 6.0 RT. This easy-to-use machine will provide you with the incredible results you desire from your at-home workout routine. The ProForm 6.0 RT is a basic treadmill that is easy to learn and operate on a daily basis. The console features large buttons that are easy to see and press even in the middle of a rigorous workout. How Does the ProForm 6.0 RT Work? The ProForm 6.0 RT is a basic treadmill that is easy to learn and operate on a daily basis. The console features large buttons that are easy to see and press even in the middle of a rigorous workout. So, whether you want to quickly change the speed or the incline of the treadmill, you can do so with the simple touch of a button and adjust smoothly through the transition so that your body can reap the most benefits from the changes. To keep track of how your body is doing throughout your workout and to make sure that you are not over-exerting yourself as you reach your fitness goals, you can continually glance down at the console, which will provide you with feedback. You can check your speed and distance traveled and adjust them as necessary until you are getting the workout you desire. And the handgrip heart monitor will even help you keep track of your heart rate so you meet your goals for burning the most calories and fat. 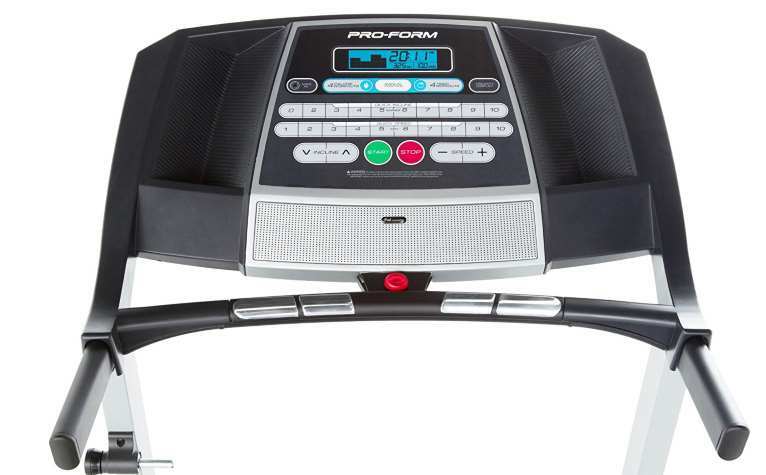 The ProForm 6.0 RT is a pretty basic machine that gives you just enough of what you need for an effective workout, including a jack for your portable music player so that you can listen to your favorite songs while you exercise. What are the Health Benefits of Using the ProForm 6.0 RT? Working out on a treadmill like the ProForm 6.0 RT will provide you with improved endurance, increased strength, and a more efficient cardiovascular and circulatory system. Your lung capacity will improve and you will notice that your lower body becomes more toned as the muscles grow stronger. And because you are doing aerobic exercises every time you go for a jog or a run on the ProForm 6.0 RT, you will also notice the pounds begin to melt away as you burn through excess calories every time you work out on this machine. The ProForm 6.0 RT received a 4.1-star overall rating from all of the customer reviews on Amazon. The majority of customers are more than satisfied with this machine, which is compact and easy to use. Many users are happy with the way this treadmill works, especially considering its low price, making it a budget-friendly option for those who cannot afford higher-end models. Users state that this treadmill is easy to assemble and, although it is smaller than other treadmills out there, it is perfect for those who prefer more compact machines if they have tight spaces in which they can exercise. 18″ x 50″ Walking Belt. Compact enough to fit comfortably in small spaces. Can handle a weight capacity of up to 300 lbs. Maximum speed of 10 mph and 0-10% incline. TreadSoft Cushioning supports your joints. Built-in Intermix Acoustics 2.0 Sound System for your portable music player. 90-day warranty on parts and labor. 5-year warranty on motor and frame. Although you can find the ProForm 6.0 RT in stores as well as online, we highly recommend sticking with Amazon.com for your purchase of this machine. By doing so, you can rest assured that, if you have any problems with the order or the shipment whatsoever, their great customer service team will handle everything until you are satisfied. Also, you cannot beat their price of $505 with free shipping. To access even more honest reviews of the ProForm 6.0 RT before you make your final buying decision, we recommend heading over to Amazon, where happy customers have been posting about their positive experiences with this treadmill. If you are looking for a basic treadmill that gives you all of the features that you require to have a good workout and reach your fitness goals, the ProForm 6.0 RT is a great option. Not only does it receive great reviews from users, but it is also affordable even for those who are on a tighter budget and cannot afford the high-end treadmills that are available today.